Discussion in 'Map Factory' started by KitMan, Oct 18, 2014. 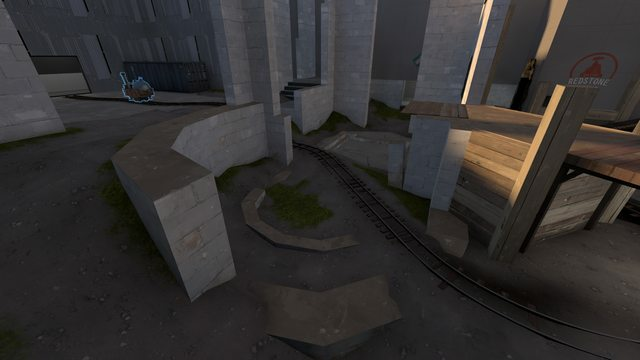 In the first screenshot, it looks like there is only one exit out of BLU spawn, which is a bad idea cos it can be very easily camped that way. 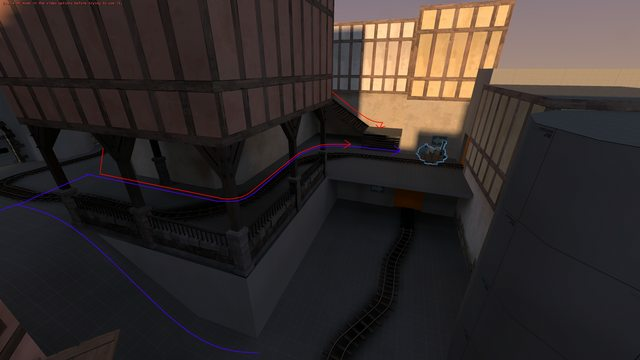 Also, a lot of the actual gameplay area looks to be in shadow, while the out-of-bounds areas are in the light. This might be a result of making the surrounding buildings quite high, but tilting your light_env downwards a little, or adding some light_spots to brighten up the ground may be a good idea. Other than that though, good work so far! - Also cool. I see what you're going for here. Really like this style. - Tunnel way too low, especially when you're supposed to push the cart there. - Dafuq. Why would anyone place a palisade inside the town, blocking a street? You could say RED put it there but that feels unplausible and raises the question "why did they not use some easy-to-move barricade instead?". - And also these shadows. 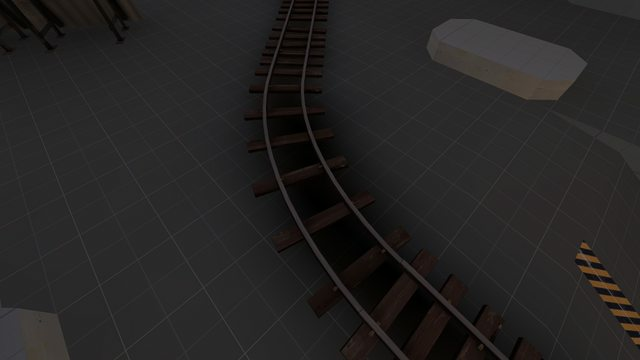 Disable also the "collision" from the tracks because the console is spamming the Vphysics error. But that's just a small pet peeve of mine. - The first part of the map feels too narrow. I found it to be about 1.2k HU, which is narrow even for 8v8. The later parts are OK, IMO. 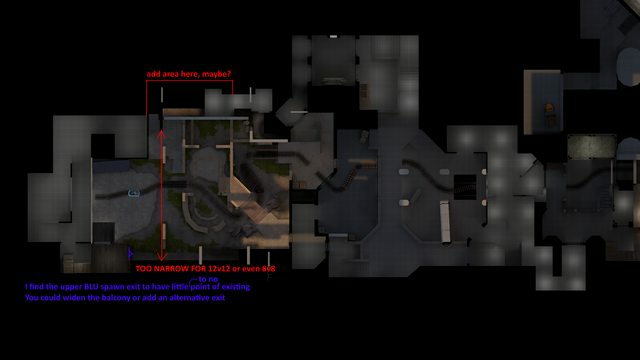 - This is the spawn for BLU after capping the second point. 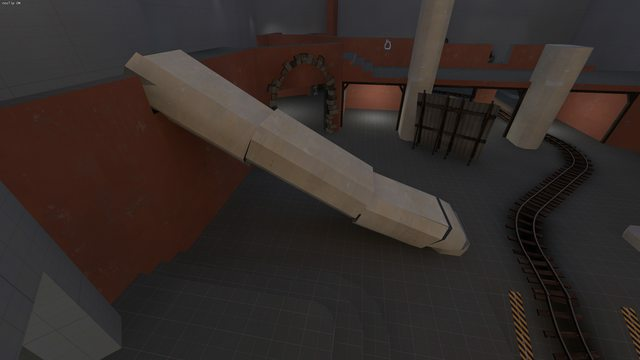 As you can see (and hopefully I drew it correctly) the "main" [A] way out is VERY much faster than the "flank" . 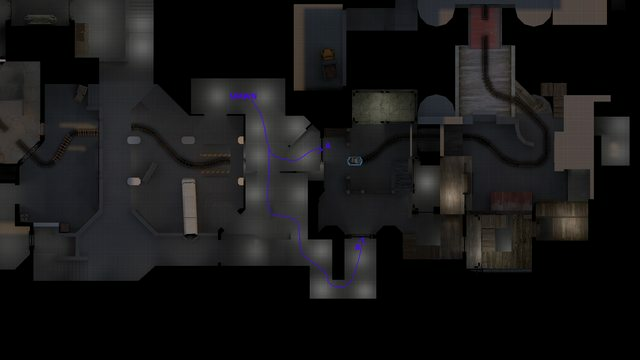 Maybe move the BLU spawn entities somewhere in between and possibly even shorten the "flank" route. 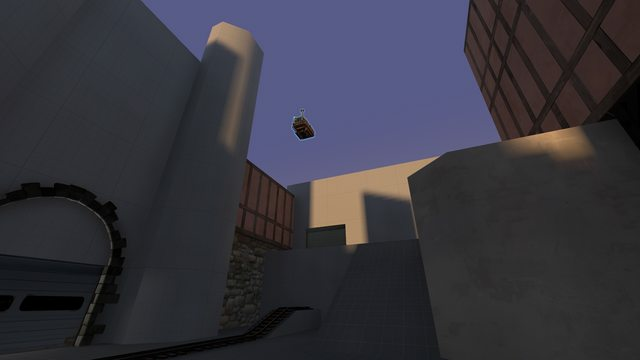 - By far the biggest flaw I found flying around in your map. This. RED have a MASSIVE positional and height advantage. BLU has to walk a long way around, EVEN PASSING BY RED SPAWN, in order to push the cart further. I have this feeling that the cart is going to get stuck after it's pushed inside the elevator. 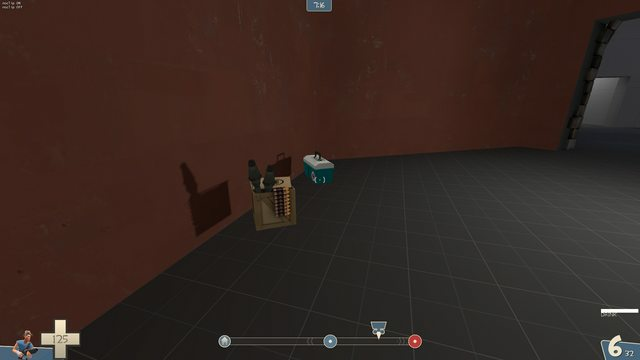 Solution: Add a second way up to the cart for BLU to use, or move the RED spawn somewhere else. 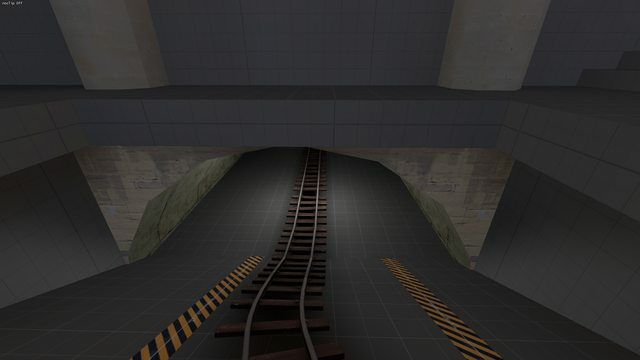 Thanks for the feedback, don't worry Blu spawn has 3 exits! Wow! 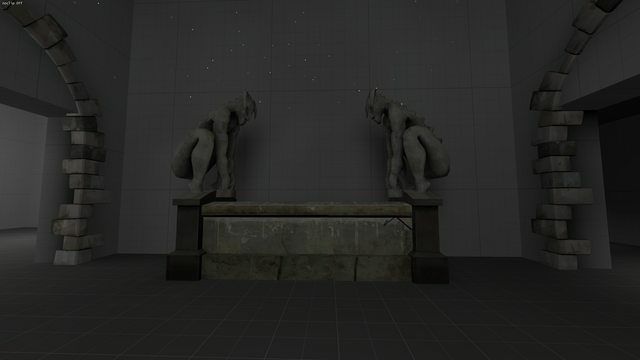 Man this is awesome, Some of the things you mentioned I'd already noticed and will probably fix, but wanted to test first. As for the other things you've been very helpful cheers! 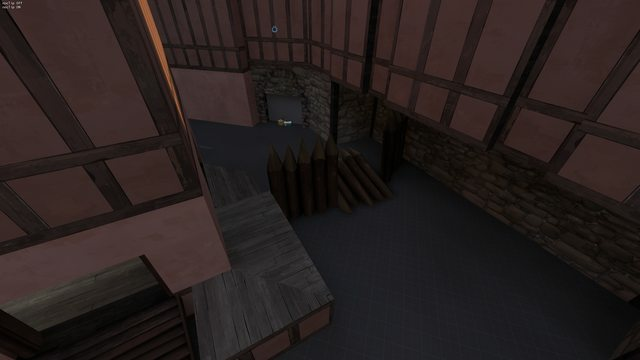 All I know is, this map looks incredible, infinitely better than anything I could have made.